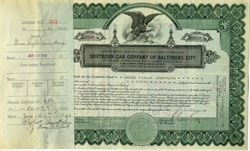 Beautifully engraved certificate from the Southern Can Company of Baltimore City issued in 1926. This historic document has an ornate border around it with a vignette of an eagle. This item has the hand signatures of the Company’s President ( E. Everett Gibbs )and Secretary ( Nelson Schuster ).